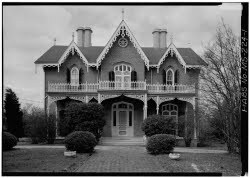 Cedarhurst Mansion in Huntsville Alabama is home to one of the most famous hauntings in Alabama. The mansion itself is hidden now. It is part of a gated community and only those that live in the community can enter, but the old ghost stories linger. They are legend. Whenever I talk about ghost stories in Alabama, someone always asks me if I have heard about this sad, lonely ghost. Her story is unforgettable and people always think of this ghost when they think of Alabama ghosts. Cedarhurst Mansion was built by Stephen Ewing in 1823. Since that time it has passed from owner to owner fairly regularly. Ironically, it isn't someone who lived in this house that haunts it. Sally Carter was just visiting Cedarhurst Mansion in 1837. She loved the mansion and was very happy to visit it. Sadly, 16 year old Sally died on November 28, 1937 of a fatal illness. She died while she was at the mansion and she hasn't left it since. Ever since Sally's death, the stories of her ghost have been as thick as kudzu. The most famous story was told by a 17 year old boy visit in the house in 1919. Alabama is prone to terrible storms and the night he stayed a storm raged outside. He said that while he slept, he was visited by Sally. She came to him and asked him to fix her tombstone. She said it had been knocked over in the storm. Everyone laughed at him, but when they went out with him to fix the stone, they found it had indeed been knocked over by the storm. I love a site called citydata.com. In that site, there are a plethora of forums on city places and event and invariably there are many postings on every haunted location. The best thing about this site is that if you sift through the nonsense you can find people who have posted their first hand accounts with ghosts. One posting on this site I read was posted by a woman who says her childhood friend used to live in Cedarhurst Mansion when she was a girl. She was lucky enough to spend the night in the house with her friend and she describes seeing Sally standing above her while she was sleeping. There are numerous stories like this about Sally. Some have even reported seeing her walking outside the mansion. Sally is still active, she's just more hidden now. But her story lives on. I love your blog! I live in Tuscaloosa/Northport and love reading about other Alabamian ghosts. Even the photo of the house feels sad and lonely. Beautiful post; as always, Jessica! what a beautiful old home--this ghost has good taste! I grew up in Huntsville, Alabama and remember as a child hearing this ghost story--thank you so much for printing it here. It has brought the whole story back to me. I could only remember details, Sally, the house, the broken tombstone. When I was growing up, kids would say you could go and chip stone off of Sally Carter's tombstone and the stone would appear back in place the next day, etc. Also, if you looked in a mirror and said "Sally Carter" three times, the mirror would crack. Fun stuff. Thank you so much for recording this story! !